Heat treatment refers to an operation or combination of operations, involving heating and cooling to alter the properties of metals, alloys plastic and ceramic materials. Changes in material's properties result from changes made in micro-structure of the material. During heat-treatment of a suitable rate, there occur changes in the micro-constituents of the metal. These changes in the micro-constituents of the metal may be in their nature, form, size and distribution in the metal piece. Obviously, temperature of heating and rate of cooling are the main controlling factors of changes in micro-constituents. These changes in micro-constituents then control the changes in physical and mechanical properties of heat treated metal specimen. Heat treatment can be applied to ingots, castings, semi-finished products, welded joints and various elements of machines and instruments. 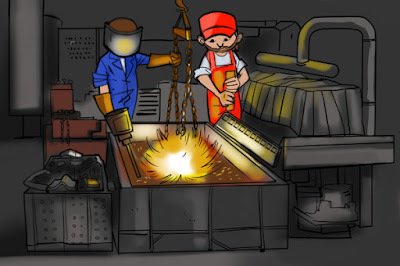 For various fabrication and manufacturing operations, heat treatment is a very important process. To remove gases from castings, to soften a metal to improve its machinability, and to increase the resistance to wear, heat and corrosion. To remove strain hardening of a cold worked metal and to improve its ductility. To relieve internal stresses set up during cold-working, casting, welding and hot-working treatments. To improve the cutting ability. To improve magnetisation property, especially of steels, for producing permanent magnets. To change or refine grain structure after hot working a metal. To soften and toughen a high carbon steel piece. To produce a single phase alloy in stainless steel and to produce a hard, wear resistant case on a tough core of a steel part. To harden non-ferrous metals and alloys, especially aluminium alloys and to produce a single phase alloy in stainless steel. To produce a hard, wear resistant case on a tough core of a steel plant and to toughen a hardened steel piece at the cost of its hardness.